Author, television producer, award winning documentary film maker, and world traveller, Tony Lee Moral, has just completed work on his second published novel, Ghost Maven, and has generously offered to share a bit of insider scoop on his new book, what drives and motivates him, and what he has planned next. Despite an increasingly busy work life, as with everything Tony takes on, he remains focused and grounded while enjoying the creative journey he rides with each new project and challenge. Welcome Tony! Q: Your work spans several genres, including documentary film-making with your own production company, journalistic interviews with celebrities, and author of several books. Is there a common thread or arc in each of these endeavours? If so, what would that be? A: Story! Story! Story! Whether it’s making a documentary film, writing a novel, or interviewing your subjects for a non-fiction book, each has the common thread of having a good story at the core. If I have something compelling to say, I will write, direct, produce, or find an outlet to tell my story. Q: Your latest project, Ghost Maven, is a YA novel, which is quite a departure from your previous books on Alfred Hitchcock and murder mysteries. Can you share a little about this story to whet a young reader’s appetite? A: In Ghost Maven, I blend mystery, with suspense and the supernatural. The central character, Alice Parker, moves to Monterey, California, with her father and little sister after her mother dies. Whilst kayaking in the bay, she paddles towards a mysterious island, but capsizes and is drowning when a young man, Henry Raphael, magically appears, delivering her safely to the beach. Against all rules, they begin seeing each other. It’s a love story with a twist. Q: Why YA at this point in your career? A: I’m inspired to write different genres, and as a compulsive communicator, I wanted to reach out to as many different readers of all ages as possible. The Young Adult readership is especially appealing to me, as I read many books in my teens and can identify with the hopes, fears and aspirations of being a teenager. It can be a very uncertain time for many teens, but I hope they identify with the characters in the book and want to share the journey with them. Q: Have you ever encountered a ghost or spirit form in your personal life or travels? If so, what happened? If not, do you believe in ghosts? A: I haven’t experienced ghosts or spirit forms, but I have had some intuitive dreams. Like Alice, I have experienced personal loss, and I use those feelings to create an atmosphere of reaching to the after life. I do believe that some things can’t be explained and science is still trying to unlock the answers. Q: What surprising correlations or similarities have you discovered between film-making and writing? A: Good storytelling is at the heart of both film-making and writing, whether it be shaping well-developed characters, creating emotional arcs and creating compelling situations. A good film or book takes the viewer or reader on a journey of discovery, enlightenment, or good old-fashioned entertainment. Q: What dissimilarities have you discovered between film-making and writing? A: With film-making, one should think in visuals, rather than relying on words or dialogue. You have a rectangle to fill with a succession of images to create an emotional response. Hitchcock said he wasn’t interested in photographs of people talking in his films, so I try to rely on visuals to tell my story when directing. In fact, I often think my novels are more like screenplays as I’m always thinking of the mise-en-scène, where the characters are, how they are dressed or what expressions they have on their faces. The advantage of writing is that you can really get inside your characters’ minds, what they are thinking and feeling, which you can’t quite do in a documentary film. Q: What would you say fuels your imagination in writing? A: Definitely travel – I’m lucky to travel with my day job as a film-maker, and I have been to some extraordinary places and have had access to some incredible situations and people. I’m like a sponge, absorbing human behaviour and thinking of how I can translate stories to the page or screen. Q: How long does it take you to write a novel from first draft to final edit? A: It depends on the publishing process. I first wrote Ghost Maven in 2010, so six years later it is being published. The last 18 months has been especially productive, as the novel was honed through various drafts, and I had some wonderful input from agents and copy editors. Q: You are represented by a literary agency, Loiacono Literary Agency, in an age when many writers are choosing to self-publish. What has been your experience in working with an agent? Q: Can you tell us a little about your production company, Sabana Films, and what you are trying to accomplish with your films? A: I won the Special Jury award last year at the Jackson Hole Wildlife Film Festival, which was an incredible, inspiring moment, and has reignited my love for natural history. I’ve started filming a documentary movie which I’m very passionate about called ‘The Cat that Changed America’. It’s about P22, the mountain lion who is trapped in Griffith Park in LA, and the wonderful conservationists and Angelenos who are trying to help him. Q: If you could sit down and spend an evening chatting with three people, dead or alive, who would they be, and why? A: Alfred Hitchcock, because I’ve written three books on the Master of Suspense, and currently writing a fourth on his reputation. His films have inspired me and are text book examples of film making and screenplay writing. F. Scott Fitzgerald, as he is my favourite author, his prose is elegant, simple and elegiac. I love The Great Gatsby, the world Fitzgerald lived through and created, and the characters who populate that world. Winston Churchill, because he epitomizes everything great about being British, what I love about England, and the country where I was born. His stoicism and heroism is something to be admired. Q: What’s next for you, Tony? A: I’m looking forward to my book tour for Ghost Maven. On Labour Day weekend, Saturday 3rd September 2016, at 2 p.m., I will be in the Old Capitol Books store in Monterey, California, signing copies of the book. It’s very special to me to launch the book in the place where the novel is set and where I lived for two inspirational years. Q Where can our readers find you online? 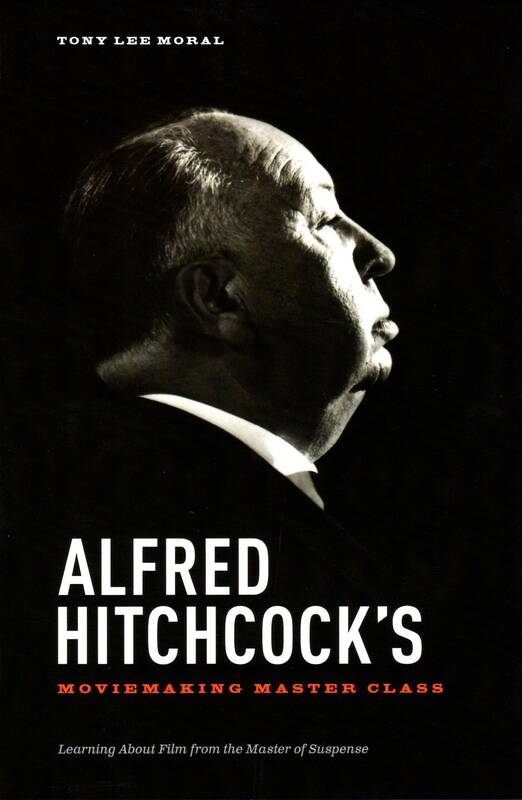 Sir Alfred Joseph Hitchcock may have left the building over 30 years ago but author Tony Lee Moral puts the legendary director/producer’s expertise at every reader’s fingertips in his new book, Alfred Hitchcock’s Moviemaking Master Class. Moral’s admiration for his subject matter is no secret; this is, after all, the third book he has penned about the iconic Master of Suspense. Q: When did the writing bug first bite you? A: From a very early age, I’ve been writing ever since I started reading. I loved adventure stories as a child, particularly the Alfred Hitchcock Presents series, such as The Three Investigators, and the Willard Price books. As a teenager, I wrote many short stories, and by the age of 16, had written my first novel (unpublished). Since then, I’ve written three non-fiction books and four novels. Q: How about the desire to become a producer/director? A: Along with my interest in writing, I’ve always been interested in film, and first discovered Alfred Hitchcock at the age of 10 when I saw I Confess. I loved the moral dilemma faced by Montgomery Clift in the lead role and even at that age could recognize Hitchcock’s craftsmanship in storytelling. At college, I really immersed myself in Hitchcock’s Films. My first job after college was working for the BBC where I spent many years working myself up to being a Producer/Director. I’ve now been working in television for half my life and all my professional life. Q: In addition to Hitchcock (obviously), who were some of the filmmakers that you would say had the most influence on the development of your own vision and style? A: I would say Ingmar Bergman, Anthony Minghella, Yasujuri Ozu and Quentin Tarantino have been inspirational to me after Hitchcock. Some of my favourite films are Persona, The English Patient, Tokyo Story and Pulp Fiction. 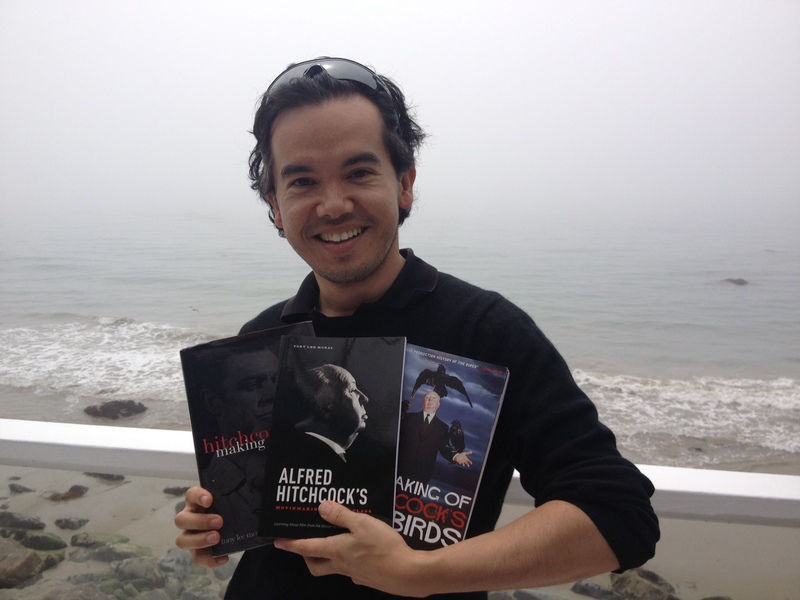 Q: Inquiring minds want to know: What inspired you to write not just one but three books about Alfred Hitchcock? A: Hitchcock’s films span the history of cinema, so for me, Hitchcock is cinema. After I wrote my first book on the making of Marnie, it seemed natural to follow it up with a book on the making of The Birds for the 50th anniversary this year. The Masterclass book came as an idea from MWP to encompass all of Hitchcock’s films and it’s very timely because the last year really has been the year of Hitchcock with all the biopics and Vertigo being voted number 1. Q: What do you feel distinguishes Alfred Hitchcock’s Moviemaking Master Class from other books on the market that have been written about him? A: It’s like a manual or text book on how to make a movie in the style of Alfred Hitchcock, using his principles of suspense, mystery, counterpoint, contrast and putting the audience through it. It’s not a biography – though you learn a lot about Hitchcock the director along the way – and it’s not an academic book – but I think it’s insightful because it’s told through the voice of Hitchcock and his many collaborators, with some great anecdotes. Q: What was your favorite chapter to write? A: Interviewing the actors who worked with Hitchcock for Chapter 4, as I was able to interview screen legendaries such as Kim Novak, Doris Day, Eva Marie Saint and Norman Lloyd. All wonderful and gracious human beings. Q: Conversely, what was the most challenging section for you to pen? A: I would say the first two chapters because it’s essential to hook and engage the reader so they want to keep on reading. I spent more time and effort on the opening chapters and rewrote them continually. Q: Who were your favorite people to interview in the course of doing research? A: I went to interview Norman Lloyd twice at his home in LA. He’s 98 years old, but very sharp and quick witted with an amazing memory. He truly is a classic and classy gentleman and as well as being an actor in Saboteur and Spellbound, he was a producer on the Alfred Hitchcock Presents series for 10 years. Q: Hollywood has a propensity for cranking out prequels, sequels and remakes of successful films, and Hitchcock’s impressive body of work is no exception, In your opinion, what were the best and worst remakes of his most popular films? Which one has yet to be remade and who would comprise the dream cast to make it a success? A: The worst remake was Gus Van Sant’s Psycho, because it’s foolhardy to replicate a classic even in the form of a homage, and the original cast is irreplaceable. I don’t think there is a best remake, but I’ll say Rear Window because of Christopher Reeves’ bravery to continue in film after his accident. I’d remake Strangers on a Train with Zachary Quinto and Henry Cavill in the lead roles. Q: You’ve indicated that your appreciation of Hitchcock’s talent deepens every time you watch one of his films. What’s the latest thing you’ve discovered? A: I recently interviewed the Assistant Director on Torn Curtain, one of Hitchcock’s lesser movies, who said that Hitchcock took great care to get realism in the reflection in the ship’s dining room window. I’ve never noticed that before which shows that even when working under less than full steam, Hitchcock paid attention to the smallest details. Q: What’s your favorite Hitchcock movie? A: I would say the definitive Hitchcock movie is North by Northwest because it has everything that you expect from his films, wit, polish, humour, panache, the wrongfully accused man, and Cary Grant’s star charisma and athleticism. My personal favourites are Vertigo and Marnie because of the psychology of the characters and what those films meant to Hitchcock. Q: What’s your take on the way he was portrayed by Anthony Hopkins? A: I enjoyed Hitchcock the movie, I thought it was a humorous and affectionate portrayal and I didn’t feel that the movie was mean spirited. Obviously there were dramatic licenses taken by the film, and Hitchcock is an enormously complicated character to define, but Hopkins brought sympathy and comedy to the role. Q: If you could sit down for lunch with the late Master of Suspense, what question would you most like to ask him that could not have be answered by anyone who ever knew him? A: I’m curious to why he was never able to repeat the success after Psycho. It seems that with that film’s monstrous success with the public and also financially, Hitchcock reached his creative peak and I’d like to know why he wasn’t able to top that. Q: What’s your best advice to the next generation of screenwriters and filmmakers? A: Know what the studios are looking for, watch a lot of films, develop your own voice, listen to people, work on distinctive dialogue. Nurture relationships as well as your talent. The best stories are out there and it’s all about finding them. A: My fourth (and probably final) Hitchcock book on his reputation and how he is perceived over 30 years since his death. This is going to be very interesting and revealing and I’ve already gathered many interviews from people who haven’t spoken out before. A: My steps to a Hitchcock education are watch The 39 Steps, Notorious, Rear Window, Vertigo, North by Northwest and Psycho. Tony Lee Moral is a writer and award winning documentary film maker who has written three books on Alfred Hitchcock: Alfred Hitchcock’s Movie Making Masterclass, The Making of Hitchcock’s The Birds and Hitchcock and the Making of Marnie. He has produced and directed over a 100 hours of television for major broadcasters in the US and the UK, including behind the scenes documentaries on films and television.